A creative approach to content marketing that will strengthen site structure, improve overall Google rankings and enhance user experience. It’s still a belief that holds true, however, not in the way it once was. It’s time to transform that belief and bring it up to speed to match today’s innovative digital marketing efforts. That starts with building a content pillar strategy, a methodical and creative approach to content development. A pillar page is a substantive page of content that covers a core topic of your business. You are basically building the mother of all content pages. Whether it is a core service or product you’d like to focus on, this pillar page will act as an authority on the matter, covering everything from general inquiries to small details. Your pillar page should focus on a topic that is expansive, leaving just enough room to dive more in-depth with supporting materials (we’ll get to that support in just a bit!). A resource page acts as a tool for users, filled to the brim with both internal and external links to the most relevant content on the topic. Although it may seem like your efforts are drawing people away from your page, you are still creating opportunity for beneficial inbound links–especially if you construct an outreach plan– improving your SEO. More often implemented, 10X pillar content is a single web page that completely deconstructs every aspect of your core topic. A 10x page is simply 10 times better than any other resource out there covering that topic. It’s ungated content with unlimited possibilities. How can you ensure your pillar page is 10 times more creative, informative and enjoyable to read? It’s a solution, answering the questions that your audience is asking and covering areas that they wouldn’t yet know to ask questions about. It offers optimal UI and UX across every device. It approaches your topic in a way that hasn’t been done before, adding a unique and intriguing factor to how your audience is consuming the information. Whichever route you choose to take, be sure that this deep-dive results in a solid pillar that your website can lean on. After developing a strong base with your pillar, we move on to that supporting material I was talking about: topic clusters. Topic clusters are additional materials created to support your pillar page. A cluster provides the opportunity to expand on what you’ve highlighted on your pillar page, allowing you to address some aspects more thoroughly. As much as your pillar page is the main hub of information, it’s your topic clusters that are attracting the users. These cluster pieces are becoming favored by popular search engines due to the rise in value of topic-based content. After creating your pillar content, you should have a few areas to expand upon that directly relate to the content on your pillar page. 84% of Internet users expect content that provides a solution, entertains, accesses their emotions and creates an experience. So, think about what your brand can deliver to your audience. No matter what you choose as supporting material, it will be unique to your content strategy. Just remember, the topic clusters should have a purpose (as should every form of content you create) and that purpose is to support your pillar page. Your topic clusters need to link back to the pillar page, strengthening its value for both the user and search engines. Though it may be simple, it is the most vital element that makes your content pillar strategy effective (besides amazing, one-of-a-kind content, of course). Internally linking your supporting material to your core pillar will create a more cohesive flow in your site’s content and establish organization in what normally is chaos. So, it’s agreed that content is still one of the most effective ways to build your business and continuously provide updated information to your customers. But would you believe that 63% of businesses don’t have a content strategy established? If that number doesn’t baffle you, then you might be part of the 63%. Here are a few benefits that a content pillar strategy can bring to your marketing efforts. Whether you believe it or not, your website might be disorganized. There is a laundry list of blog posts that are nonsensically linked throughout your site (or worse, not at all), thirsty service or product pages that aren’t serving a purpose, and perhaps, valuable videos and infographics that are being underutilized. 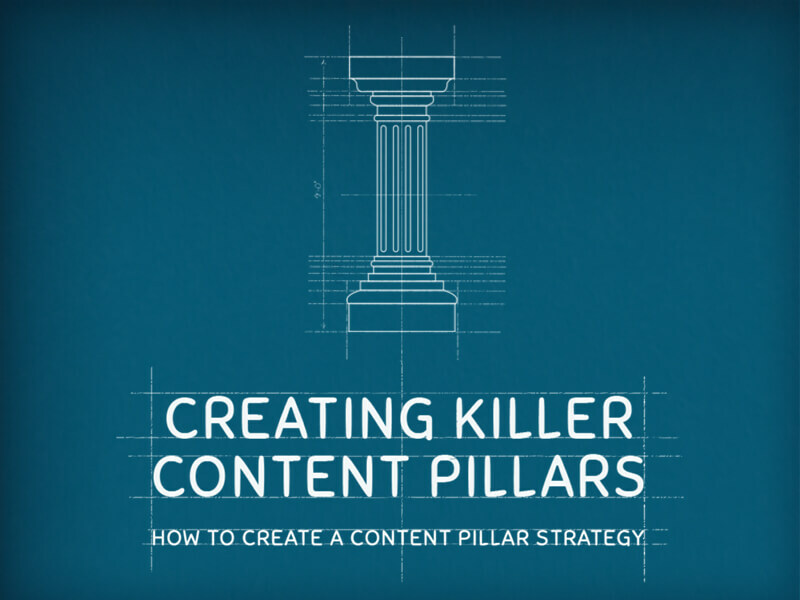 Organize the structure of your content with a more solid foundation: content pillars. Each pillar page will internally link to its topic clusters, and vice versa, strengthening the core of your website and structural flow. Google and other search engines are constantly evolving. However, they will never fail to work with the user in mind. Your substantive pillar piece combined with its equally valuable topic clusters, will prove to the search engines that your page is an authority to be reckoned with, and it will effectively improve your overall rankings. Your content pillar strategy will not only provide improved crawlability for search engines, it will also work towards creating a better user experience. As you create a better user flow with your internal links and provide informative and beneficial content, you will successfully make your website more user-friendly and turn what used to be passing clicks, into conversions. SEO plays an integral role in constructing a content strategy that works for you. First you must find a broad topic for your pillar page, that you want to rank for and that people are searching for. Remember, it needs to be a keyword that’s expansive enough for you to create content that adds value, but not one of those big-ticket phrases that you have no chance of ranking for. So, how do you find the right keyword to target with your content pillar? Put the time in to research the keywords that align with the goals of your pillar page and the services/products you offer. Many will tell you that it’s search volume that should determine the keywords targeted in your content pillar strategy, but it’s truly relative to your industry. Ideally, you’d want to aim for a higher monthly search volume with low competition. Like I said, that would be the ideal situation. It might not be the one you’re in now, but not to worry! There are a few different things you can do to ensure that you’re targeting the most opportunistic keywords. If you are running paid ads for a keyword, that data can be taken into consideration. Are you seeing a decent ROI? If so, then you’re more likely able to thrive focusing on that keyword for your pillar strategy. Keywords Everywhere: A free extension that streamlines the keyword research process. After searching a keyword or phrase, this tool will populate the search volume per month, the cost per click, and competitor’s data from multiple websites. Keywords Everywhere isn’t the only tool you have to rely on. Check out the top 19 free SEO tools that can help you with your keyword research and solidifying your content pillars. Simply put, what is your best bet? What is the phrase that you both want to rank for and can rank for? In the US, one-word keywords account for approximately 2.8% of all keywords people search for, with 41.7% of searches being keyword phrases of five or more words. In other words, long-tailed keyword phrases are your new best friend. As I mentioned before, search engines are starting to favor topic-based content. People are becoming more conversational with their searches. Whether they are typing their exact thought process into the search bar, or are leaving the work to their trusted assistant, Siri, search engines have taken notice and are quickly adapting to become more people-friendly. This means focusing on long-tailed keyword phrases that can help us explore the limits of our pillar page and construct beneficial topic clusters. AnswerThePublic: A search insight tool that allows you to get inside the head of your audience. Type in a keyword or search query of your own and you’ll be presented with questions surrounding that topic. Google Autocomplete: As a user begins to type, Google tries to fill in the blanks with predictive text based on past search queries. 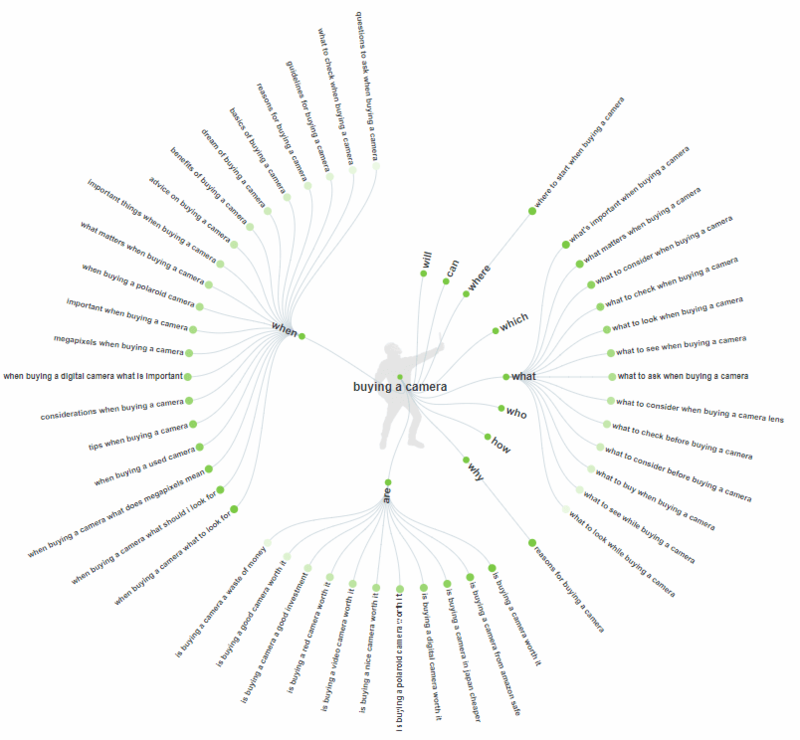 This gives you a look into what people are searching for surrounding your topic. 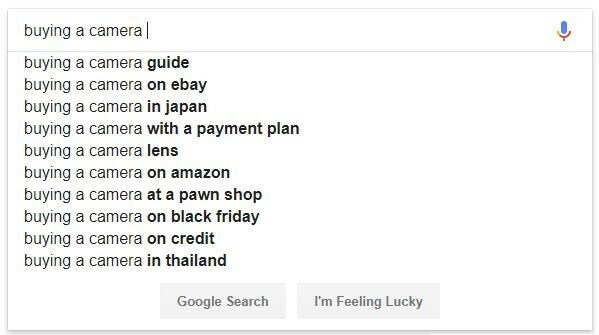 “People also ask…”: Similar to Google autocomplete is an accordion-type prompt that, again, uses past search queries to direct the user to the right location (in their opinion). “Searches related to…”: Scroll all the way down to the bottom of the page and you’ll find a generous, though often forgotten tool: links to, you guessed it! Other search queries that may hold the answers to what the user is trying to search for. Once you think you have the keyword you’d like to target, go ahead and search for it. See what the competition is presenting to the user. Think about why they are ranked before you, or perhaps on the first page in general. What information are they providing that has earned them that spot? I personally find this simple competitor analysis the most important part of your research. It will show you exactly why you’re not ranking well for that keyword, and where you may need to improve your content, scannability and visuals. Get to know your audience. Who exactly are you targeting (age, gender, location, etc.) and how do you plan to engage them with your content? Are you able to then convert? What are their wants, interests and needs? Is there a preference for presentation? What information will they need to turn their visit into a conversion? As you build your strategy, think from the mindset of a user. Ask the questions that they would ask and think about the information they’re searching for. After you have chosen the topic to focus your content pillar on, it doesn’t mean you have to start from scratch. Look at the content that already exists on your site. You can easily take on the task by diving into your Google Analytics account to see what pages your audience is coming to most often and perhaps determine what’s causing them to bounce. Do you have existing content that can act as either the pillar page or possible supporting content? Consider if the content you already have in place offers the relevant information that a user would need. Then audit your blog, taking note of potential posts that could be repurposed or redirected and used for your following topic clusters. There’s no point in valuable content if no one knows it’s there. So, although you feel as though you’ve done your part in producing the content and are waiting for the search engines to recognize the change, utilize your social media presence. Be proactive and share your content! Implementing social media marketing into your content pillar strategy will increase the likelihood that your high-quality content will be seen and clicked on, through organic interactions or boosted posts. Now it’s time to measure the success of your content pillars and there are a few ways you can do it. Think about the goals you set for yourself before implementing this strategy. Were you looking to increase traffic to your site? Perhaps you were aiming for more conversions? Gain followers? Spread awareness? Whatever you set your goals to be will determine how you measure the success of your strategy. It’s not enough to put content on a page; there needs to be a purpose. Take the time to develop your pillars, fitting the strategy to your needs and overall goals of your company. Once complete, you will have created a stronger foundation for your website that will allow you to keep growing and building out your content, establishing your voice as an authority in the eyes of the users and the search engines.